Vladimir Sergeyevich Khapersky (29/04/1932, Moscow) is a famous musician, performer and arranger. He started playing children's harmonica when he was 4 years old. His professional studies began in 1945 at music school where he was immediately enrolled into the third year of studies in the class of V.P.Tyurikov. During 1947-1950 he attended a music school named after October Revolution and during 1957-1959 he joined the class of V.M.Motov at Gnessines music school. During 1964 he upgraded his skills in the class of M.Ya.Chaykina, and took lessons in composing with H.I.Litinsky at the same school. In different periods he worked as a bandsman at Pyatnitsky Choir, a variety soloist in different entertainment organizations of Moscow City and philharmonic societies of Omsk City, Siberia. Many times he toured abroad. He visited England, France, Sweden, Denmark, Germany, Greece, Scotland, New Zealand, China and many other countries. The musician's repertoire consists of foreign and domestic classical pieces, modern compositions and own music. He is the author of numeral original pieces and arrangements for bayan, accordion and ensembles. This publication is dedicated to a little known page of musician's heritage: jazz music. 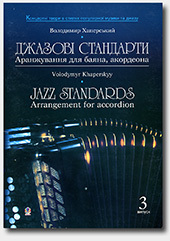 in Musette Style Accordion in Jazz V.Khapersky.